An icon of unspeakable distinction passed on today, Elizabeth Taylor. A woman of beauty, charm, passion, strength and presence, she grabbed us both on and off the screen throughout her career and her life. She was a woman of class who had the power to don respect and admiration throughout the world. I was saddened by her passing, but it was more internalized for me. Often, we try to find a celebrity to compare ourselves. I cannot quite define the reason, but we often feel that if we can live our own lives vicariously through a celebrity, a little piece of that lifestyle stays with us. Each time, I visit my childhood home, I see the beautiful wedding picture of my mother and father and each time I am in awe on how closely my mother resembled Elizabeth Taylor at the height of her beauty and elegance. Born less than a year apart, my mother fought diabetes and congestive heart failure as she battled the final years of her life. Just to my left is a picture of my mother at the age of 10 with a bird, my uncle and a friend on a farm in Upstate New York. Like National Velvet, she had a glow as a child that carried forward into her adult years. I have often and continue to admire the strength of my mother much similar to how others share stories of Elizabeth Taylor. As the world mourns the death of a screen legend, it is a moment to reflect once again on my mother. Now in some other plane, the two who I often felt led parallel lives in a different perspective can finally meet. 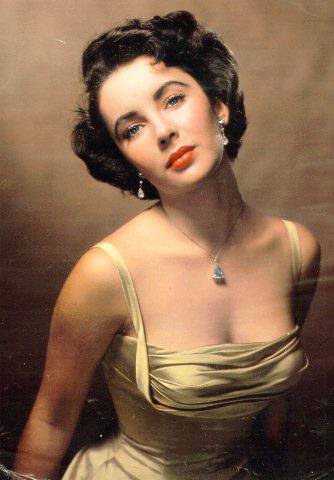 Mom, I would like to introduce you to Elizabeth Taylor. Now, neither one is in pain. Previous Charity: Why aren’t you doing it??? ?